Because Qedit for Windows 5.0 is the annual update release, this page lists the changes since version 4.8 (the previous year's update). You can execute host commands directly from Qedit for Windows. 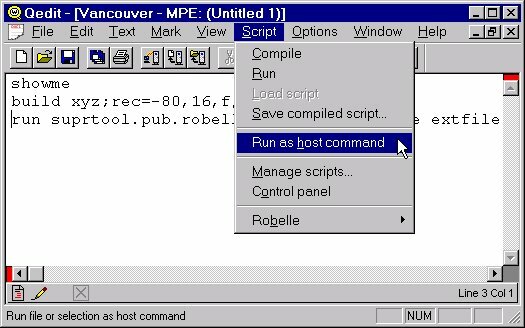 Host commands can be any command normally available from the command interpreter (MPE) or the shell (UNIX). For example, you can compile source files or display environment information. Access to host commands can be disabled using a Set command in one of the server configuration files. Qedit Scripting Language (QSL) is available to perform common editing tasks, add customer-defined functions or automate edit functions. 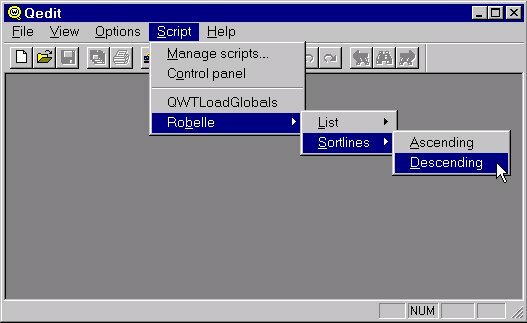 The Robelle script library comes with 5 Qedit Scripting Language scripts. Four of them are automatically loaded and available for use whenever you start Qedit. The Sortlines script allows you to sort lines of text. The ListInclude, ListUse and ListCopy scripts find and list all lines containing a specified search string. These scripts can scan referenced files within the main source file. The last script, MPECompile, is not automatically loaded. It contains compile instructions for compilers most often found on an HP e3000. This way, you can easily compile your programs straight from Qedit. You can configure Qedit to use different color schemes for document windows. Each color scheme allows the configuration of certain window elements. You can select a default color scheme for all files, for each file type (local, UNIX and MPE), for individual connections or individual files. The radio buttons on the Shift columns dialog box are correctly grouped: Left with Right, Selection only with Entire file. Line shifting with TAB and SHIFT+TAB is not allowed if there is an active rectangular selection. Using the Insert command on a selection updates only the correct number of lines. Pasting a rectangular selection enables the Save tool correctly. 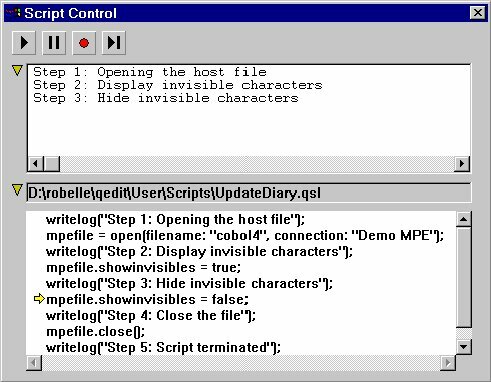 When you bring the cursor in the To text box of the Delete Columns dialog box, Qedit automatically fills the text box with the file Record Length. This makes it easier to remove text at the end of the lines. Typing text with an active rectangular selection deactivates the selection and puts the new text at the upper left corner of the selection. If you call up the Find dialog box while there is an active selection, the selection becomes the search string unless the previous search used a pattern or a regular expression. The Replace function works correctly when the selected text does not span multiple lines. Qedit replaces string occurrences within the selection only. Escaped sequences can be used in the replacement string for a Replace operation using a regular expression. This permits the use of non-printing characters as replacements. Qedit displays end-of-line markers when the Show invisibles option of the View menu is enabled. If the Caret allowed in undefined areas option is enabled, Qedit does not scroll left or right while you browse through the file. You can save the current cursor position (Push location on caret stack) or return to a previously saved location (Pop caret) using the document shortcut menu (right-click). The Copy pathname to clipboard command on the document shortcut menu (right-click) saves the fully-qualified filename of the active document to the clipboard. Commands related to the caret stack have been reworded to better describe the feature. Push caret and other variations have been renamed to Save position. Pop caret and other variations have been renamed to Go to previous position. Exchange caret has been renamed to Exchange position. Note that command mnemonics e.g. ALT+M+P have changed at the same time. You can select the line termination character to be used when saving local files. This allows creation of files compatible with DOS, Apple Macintosh and Unix systems. 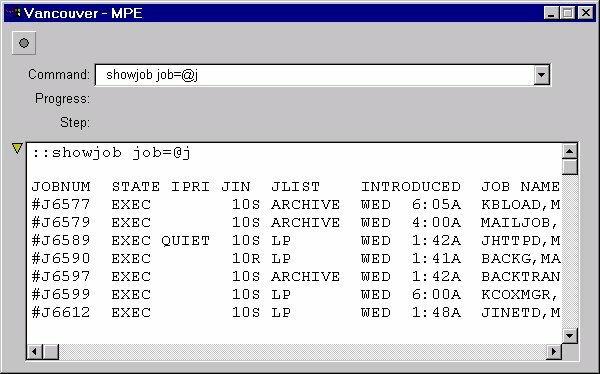 The Last modified timestamp in the Directory dialog for files on an MPE connection is calculated properly. You can open up to 30 files simultaneously on a single connection. The previous limit allowed up to 10 files. The server is better at identifying and opening files in the POSIX namespace from the Directory dialog box of MPE hosts. Qedit correctly sets the cursor position if you are moving up and down the file using the arrow keys while the Caret allowed in undefined areas option enabled. Pasting lines in a host Cobol source file updates the tag values for the affected lines only. Cobol tags are updated on modified lines even if the Display tag option is disabled on the COBX tab of the Properties dialog box. All edit operations are updating the COBOL tags correctly. After a maintenance operation in the Connection List dialog box such as removing an existing connection, the cursor remains available in the appropriate text box. The 4200-line limit for copying to the local clipboard has been removed. You can copy as many lines as the PC resources allow. The Qedit for Windows User Manual, Qedit Scripting Language Reference Manual and Quick Start Guide are distributed in Adobe PDF files. They are in the Manuals subdirectory under the install directory. They can be viewed on the screen using Adobe Acrobat Reader. Acrobat Reader also allows you to print them. As you enter a right parenthesis, Qedit temporarily highlights the matching left parenthesis to delimit the scope of the enclosed text. If there is no matching left parenthesis, Qedit beeps. Qedit does not abort on exit after detecting that a file had been modified by another user. Qedit does not incorrectly display a space marker at the right edge of the document window. Qedit correctly saves the last cursor position when files are closed while exiting Qedit. Scrolling through a split-view document with a mouse using the Intellipoint software works correctly. Qedit does not abort anymore after selecting the last line of the file and trying to replace it with the clipboard contents. Qedit does not go into a loop if the entered text reaches the right margin. It does not allow the cursor past the right border and "beeps". If there has been a problem opening a local file, Qedit does not abort on exit with a linecount out of sync error. CTRL+ (left arrow) to bring the cursor to the previous word on the line is working again. Defining a rectangular selection with the mouse is working correctly. Pasting the clipboard overtop the last line of a file does not cause an error (server error 3). An escaped character such as \t in the replacement string of a regular expression does not cause an infinite loop. The Shift left and Shift right commands shifts only the correct number of lines, even when whole lines are selected. When executing host commands, the server does not display trace messages to the system console. Compiler output files used by the MPECompile script are created as temporary files on MPE. CTRL+END while Qedit is in the process of opening a host file does not cause an abort. The many enhancements and bug fixes since version 4.8 are listed below. They are grouped in broad categories.